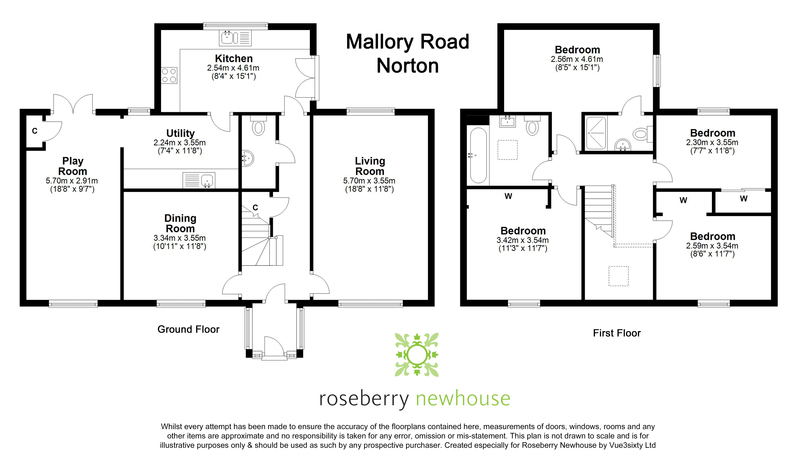 Nestled behind Norton High Street with a charismatic walled garden, this architecturally-designed residence offers the perfect balance of contemporary comforts within a discrete and mature location. Perfectly-proportioned and offering a discrete mature location nestled behind Norton High Street, this superb modern residence offers the best of both worlds providing the comforts and convenience of a contemporary home whilst being within the heart of an established community with a wealth of highly acclaimed amenities all on the doorstep. Architecturally-designed and built in 2014, this remarkable property boasts not only a thoughtfully-planned layout but an abundance of kerb-appeal too and is certain to impress with its blend of contemporary and character features both inside and out offering accommodation to briefly comprise; bright Entrance Porch with inner door leading through to the Reception Hallway with a striking mezzanine Landing and vaulted ceiling with skylight, under stairs Cloakroom, Living Room with double aspect windows creating an abundance of natural light, separate Dining Room, Breakfast-Kitchen with farmhouse-style units, integrated appliances and solid wood work surfaces, separate Utility Room and converted garage to create a recently-transformed Play/Games Room with French doors opening out to the walled charismatic garden. To the first floor, four double Bedrooms share access to an indulgent Family Bathroom whilst the Master Suite also offers an En-Suite Shower Room alongside double wardrobe provisions to three. Externally, minimal-maintenance gardens are provided to both the front and rear with a sun-trap barbeque and patio seating area and a block-paved driveway for off-road parking. An unrivalled opportunity and one not to be missed; viewing is a must in order to appreciate the overall space, location and lifestyle available with this remarkable forever home certain to impress the most discerning of buyers and their guests. Dining Room 11'8" x 10'11" (3.56m x 3.33m). Living Room 18'8" x 11'8" (5.7m x 3.56m). Breakfast Kitchen 15'1" x 8'4" (4.6m x 2.54m). Utility Room 11'8" x 7'4" (3.56m x 2.24m). Play/Games Room 18'8" x 9'7" (5.7m x 2.92m). Master Bedroom 15'1" x 8'5" (4.6m x 2.57m). Bedroom Two 11'7" x 11'3" (3.53m x 3.43m). Bedroom Three 11'7" x 8'6" (3.53m x 2.6m). Bedroom Four 11'8" x 7'7" (3.56m x 2.31m).